Wherever a bee might fly within the bounds of this virgin wilderness—through the redwood forests, along the banks of the rivers, along the bluffs and headlands fronting the sea, over valley and plain, park and grove, and deep, leafy glen, or far up the piny slopes of the mountains—throughout every belt and section of climate up to the timber line, bee-flowers bloomed in lavish abundance. Here they grew more or less apart in special sheets and patches of no great size, there in broad, flowing folds hundreds of miles in length—zones of polleny forests, zones of flowery chaparral, stream tangles of rubus and wild rose, sheets of golden compositæ, beds of violets, beds of mint, beds of bryanthus and clover, and so on, certain species blooming somewhere all the year round. The Great Central Plain of California, during the months of March, April, and May, was one smooth, continuous bed of honey-bloom, so marvelously rich that, in walking from one end of it to the other, a distance of more than 400 miles, your foot would press about a hundred flowers at every step. Mints, gilias, nemophilas, castilleias, and innumerable compositæ were so crowded together that, had ninety-nine per cent. of them been taken away, the plain would still have seemed to any but Californians extravagantly flowery. The radiant, honey-ful corollas, touching and overlapping, and rising above one another, glowed in the living light like a sunset sky—one sheet of purple and gold, with the bright Sacramento pouring through the midst of it from the north, the San Joaquin from the south, and their many tributaries sweeping in at right angles from the mountains, dividing the plain into sections fringed with trees. Along the rivers there is a strip of bottom-land, countersunk beneath the general level, and wider toward the foot-hills, where magnificent oaks, from three to eight feet in diameter, cast grateful masses of shade over the open, prairie-like levels. And close along the water’s edge there was a fine jungle of tropical luxuriance, composed of wild-rose and bramble bushes and a great variety of climbing vines, wreathing and interlacing the branches and trunks of willows and alders, and swinging across from summit to summit in heavy festoons. Here the wild bees reveled in fresh bloom long after the flowers of the drier plain had withered and gone to seed. And in midsummer, when the “blackberries” were ripe, the Indians came from the mountains to feast—men, women, and babies in long, noisy trains, often joined by the farmers of the neighborhood, who gathered this wild fruit with commendable appreciation of its superior flavor, while their home orchards were full of ripe peaches, apricots, nectarines, and figs, and their vineyards were laden with grapes. But, though these luxuriant, shaggy river-beds were thus distinct from the smooth, treeless plain, they made no heavy dividing lines in general views. The whole appeared as one continuous sheet of bloom bounded only by the mountains. Sauntering in any direction, hundreds of these happy sun-plants brushed against my feet at every step, and closed over them as if I were wading in liquid gold. The air was sweet with fragrance, the larks sang their blessed songs, rising on the wing as I advanced, then sinking out of sight in the polleny sod, while myriads of wild bees stirred the lower air with their monotonous hum—monotonous, yet forever fresh and sweet as every-day sunshine. Hares and spermophiles showed themselves in considerable numbers in shallow places, and small bands of antelopes were almost constantly in sight, gazing curiously from some slight elevation, and then bounding swiftly away with unrivaled grace of motion. Yet I could discover no crushed flowers to mark their track, nor, indeed, any destructive action of any wild foot or tooth whatever. All the seasons of the great plain are warm or temperate, and bee-flowers are never wholly wanting; but the grand springtime—the annual resurrection—is governed by the rains, which usually set in about the middle of November or the beginning of December. Then the seeds, that for six months have lain on the ground dry and fresh as if they had been gathered into barns, at once unfold their treasured life. The general brown and purple of the ground, and the dead vegetation of the preceding year, give place to the green of mosses and liverworts and myriads of young leaves. Then one species after another comes into flower, gradually overspreading the green with yellow and purple, which lasts until May. The “rainy season” is by no means a gloomy, soggy period of constant cloudiness and rain. Perhaps nowhere else in North America, perhaps in the world, are the months of December, January, February, and March so full of bland, plant-building sunshine. Referring to my notes of the winter and spring of 1868-69, every day of which I spent out of doors, on that section of the plain lying between the Tuolumne and Merced rivers, I find that the first rain of the season fell on December 18th. January had only six rainy days—that is, days on which rain fell; February three, March five, April three, and May three, completing the so-called rainy season, which was about an average one. The ordinary rain-storm of this region is seldom very cold or violent. The winds, which in settled weather come from the northwest, veer round into the opposite direction, the sky fills gradually and evenly with one general cloud, from which the rain falls steadily, often for days in succession, at a temperature of about 45° or 50°. More than seventy-five per cent. of all the rain of this season came from the northwest, down the coast over southeastern Alaska, British Columbia, Washington, and Oregon, though the local winds of these circular storms blow from the southeast. One magnificent local storm from the northwest fell on March 21. 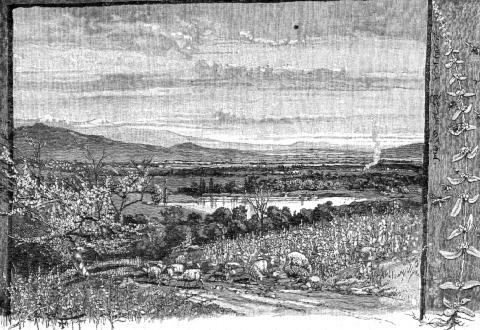 A massive, round-browed cloud came swelling and thundering over the flowery plain in most imposing majesty, its bossy front burning white and purple in the full blaze of the sun, while warm rain poured from its ample fountains like a cataract, beating down flowers and bees, and flooding the dry watercourses as suddenly as those of Nevada are flooded by the so-called “cloud-bursts.” But in less than half an hour not a trace of the heavy, mountain-like cloud-structure was left in the sky, and the bees were on the wing, as if nothing more gratefully refreshing could have been sent them. June, July, August, and September is the season of rest and sleep,—a winter of dry heat,—followed in October by a second outburst of bloom at the very driest time of the year. Then, after the shrunken mass of leaves and stalks of the dead vegetation crinkle and turn to dust beneath the foot, as if it had been baked in an oven, Hemizonia virgata , a slender, unobtrusive little plant, from six inches to three feet high, suddenly makes its appearance in patches miles in extent, like a resurrection of the bloom of April. I have counted upward of 3000 flowers, five eighths of an inch in diameter, on a single plant. Both its leaves and stems are so slender as to be nearly invisible, at a distance of a few yards, amid so showy a multitude of flowers. The ray and disk flowers are both yellow, the stamens purple, and the texture of the rays is rich and velvety, like the petals of garden pansies. The prevailing wind turns all the heads round to the southeast, so that in facing northwestward we have the flowers looking us in the face. In my estimation, this little plant, the last born of the brilliant host of compositæ that glorify the plain, is the most interesting of all. It remains in flower until November, uniting with two or three species of wiry eriogonums, which continue the floral chain around December to the spring flowers of January. Thus, although the main bloom and honey season is only about three months long, the floral circle, however thin around some of the hot, rainless months, is never completely broken. The present condition of the Grand Central Garden is very different from that we have sketched. About twenty years ago, when the gold placers had been pretty thoroughly exhausted, the attention of fortune-seekers—not home-seekers—was, in great part, turned away from the mines to the fertile plains, and many began experiments in a kind of restless, wild agriculture. A load of lumber would be hauled to some spot on the free wilderness, where water could be easily found, and a rude box-cabin built. Then a gang-plow was procured, and a dozen mustang ponies, worth ten or fifteen dollars apiece, and with these hundreds of acres were stirred as easily as if the land had been under cultivation for years, tough, perennial roots being almost wholly absent. Thus a ranch was established, and from these bare wooden huts, as centers of desolation, the wild flora vanished in ever-widening circles. But the arch destroyers are the shepherds, with their flocks of hoofed locusts, sweeping over the ground like a fire, and trampling down every rod that escapes the plow as completely as if the whole plain were a cottage garden-plot without a fence. But notwithstanding these destroyers, a thousand swarms of bees may be pastured here for every one now gathering honey. The greater portion is still covered every season with a repressed growth of bee-flowers, for most of the species are annuals, and many of them are not relished by sheep or cattle, while the rapidity of their growth enables them to develop and mature their seeds before any foot has time to crush them. The ground is, therefore, kept sweet, and the race is perpetuated, though only as a suggestive shadow of the magnificence of its wildness. The time will undoubtedly come when the entire area of this noble valley will be tilled like a garden, when the fertilizing waters of the mountains, now flowing to the sea, will be distributed to every acre, giving rise to prosperous towns, wealth, arts, etc. Then, I suppose, there will be few left, even among botanists, to deplore the vanished primeval flora. In the mean time, the pure waste going on—the wanton destruction of the innocents—is a sad sight to see, and the sun may well be pitied in being compelled to look on. Next the plain there is, first, a series of smooth hills, planted with a rich and showy vegetation that differs but little from that of the plain itself—as if the edge of the plain had been lifted and bent into flowing folds, with all its flowers in place, only toned down a little as to their luxuriance, and a few new species introduced, such as the hill lupines, mints, and gilias. The colors show finely when thus held to view on the slopes; patches of red, purple, blue, yellow, and white, blending around the edges, the whole appearing at a little distance like a map colored in sections. Nearer the coast are the giant forests of the redwoods, extending from near the Oregon line to Santa Cruz. Beneath the cool, deep shade of these majestic trees the ground is occupied by ferns, chiefly woodwardia and aspidiums, with only a few flowering plants—oxalis, trientalis, erythronium, fritillaria, smilax, and other shade-lovers. But all along the redwood belt there are sunny openings on hill-slopes looking to the south, where the giant trees stand back, and give the ground to the small sunflowers and the bees. Around the lofty redwood walls of these little bee-acres there is usually a fringe of Chestnut Oak, Laurel, and Madroño, the last of which is a surpassingly beautiful tree, and a great favorite with the bees. The trunks of the largest specimens are seven or eight feet thick, and about fifty feet high; the bark red and chocolate colored, the leaves plain, large, and glossy, like those of Magnolia grandiflora , while the flowers are yellowish-white, and urn-shaped, in well-proportioned panicles, from five to ten inches long. When in full bloom, a single tree seems to be visited at times by a whole hive of bees at once, and the deep hum of such a multitude makes the listener guess that more than the ordinary work of honey-winning must be going on. How perfectly enchanting and care-obliterating are these withdrawn gardens of the woods—long vistas opening to the sea—sunshine sifting and pouring upon the flowery ground in a tremulous, shifting mosaic, as the light-ways in the leafy wall open and close with the swaying breeze—shining leaves and flowers, birds and bees, mingling together in springtime harmony, and soothing fragrance exhaling from a thousand thousand fountains! In these balmy, dissolving days, when the deep heart-beats of Nature are felt thrilling rocks and trees and everything alike, common business and friends are happily forgotten, and even the natural honey-work of bees, and the care of birds for their young, and mothers for their children, seem slightly out of place. Though the coast region was the first to be invaded and settled by white men, it has suffered less from a bee point of view than either of the other main divisions, chiefly, no doubt, because of the unevenness of the surface, and because it is owned and protected instead of lying exposed to the flocks of the wandering “sheepmen.” These remarks apply more particularly to the north half of the coast. Farther south there is less moisture, less forest shade, and the honey flora is less varied. Up through the forest region, to a height of about 9000 feet above sea-level, there are ragged patches of manzanita, and five or six species of ceanothus, called deer-brush or California lilac. These are the most important of all the honey-bearing bushes of the Sierra. Chamæbatia foliolosa , a little shrub about a foot high, with flowers like the strawberry, makes handsome carpets beneath the pines, and seems to be a favorite with the bees; while pines themselves furnish unlimited quantities of pollen and honey-dew. The product of a single tree, ripening its pollen at the right time of year, would be sufficient for the wants of a whole hive. Along the streams there is a rich growth of lilies, larkspurs, pedicularis, castilleias, and clover. The alpine region contains the flowery glacier meadows, and countless small gardens in all sorts of places full of potentilla of several species, spraguea, ivesia, epilobium, and goldenrod, with beds of bryanthus and the charming cassiope covered with sweet bells. Even the tops of the mountains are blessed with flowers,—dwarf phlox, polemonium, ribes, hulsea, etc. I have seen wild bees and butterflies feeding at a height of 13,000 feet above the sea. Many, however, that go up these dangerous heights never come down again. Some, undoubtedly, perish in storms, and I have found thousands lying dead or benumbed on the surface of the glaciers, to which they had perhaps been attracted by the white glare, taking them for beds of bloom. Shasta, as we have already seen, is a fire-mountain created by a succession of eruptions of ashes and molten lava, which, flowing over the lips of its several craters, grew outward and upward like the trunk of a knotty exogenous tree. Then followed a strange contrast. The glacial winter came on, loading the cooling mountain with ice, which flowed slowly outward in every direction, radiating from the summit in the form of one vast conical glacier—a down-crawling mantle of ice upon a fountain of smoldering fire, crushing and grinding for centuries its brown, flinty lavas with incessant activity, and thus degrading and remodeling the entire mountain. When, at length, the glacial period began to draw near its close, the ice-mantle was gradually melted off around the bottom, and, in receding and breaking into its present fragmentary condition, irregular rings and heaps of moraine matter were stored upon its flanks. The glacial erosion of most of the Shasta lavas produces detritus, composed of rough, sub-angular boulders of moderate size and of porous gravel and sand, which yields freely to the transporting power of running water. Magnificent floods from the ample fountains of ice and snow working with sublime energy upon this prepared glacial detritus, sorted it out and carried down immense quantities from the higher slopes, and reformed it in smooth, delta-like beds around the base; and it is these flood-beds joined together that now form the main honey-zone of the old volcano. Thus, by forces seemingly antagonistic and destructive, has Mother Nature accomplished her beneficent designs—now a flood of fire, now a flood of ice, now a flood of water; and at length an outburst of organic life, a milky way of snowy petals and wings, girdling the rugged mountain like a cloud, as if the vivifying sunbeams beating against its sides had broken into a foam of plant-bloom and bees, as sea-waves break and bloom on a rock shore. In this flowery wilderness the bees rove and revel, rejoicing in the bounty of the sun, clambering eagerly through bramble and hucklebloom, ringing the myriad bells of the manzanita, now humming aloft among polleny willows and firs, now down on the ashy ground among gilias and buttercups, and anon plunging deep into snowy banks of cherry and buckthorn. They consider the lilies and roll into them, and, like lilies, they toil not, for they are impelled by sun-power, as water-wheels by water power; and when the one has plenty of high-pressure water, the other plenty of sunshine, they hum and quiver alike. Sauntering in the Shasta bee-lands in the sun-days of summer, one may readily infer the time of day from the comparative energy of bee-movements alone—drowsy and moderate in the cool of the morning, increasing in energy with the ascending sun, and, at high noon, thrilling and quivering in wild ecstasy, then gradually declining again to the stillness of night. In my excursions among the glaciers I occasionally meet bees that are hungry, like mountaineers who venture too far and remain too long above the bread-line; then they droop and wither like autumn leaves. The Shasta bees are perhaps better fed than any others in the Sierra. Their field-work is one perpetual feast; but, however exhilarating the sunshine or bountiful the supply of flowers, they are always dainty feeders. Humming-moths and humming-birds seldom set foot upon a flower, but poise on the wing in front of it, and reach forwardas if they were sucking through straws. But bees, though as dainty as they, hug their favorite flowers with profound cordiality, and push their blunt, polleny faces against them, like babies on their mother’s bosom. And fondly, too, with eternal love, does Mother Nature clasp her small bee-babies, and suckle them, multitudes at once, on her warm Shasta breast. Besides the common honey-bee there are many other species here—fine mossy, burly fellows, who were nourished on the mountains thousands of sunny seasons before the advent of the domestic species. Among these are the bumblebees, mason-bees, carpenter-bees, and leaf-cutters. Butterflies, too, and moths of every size and pattern; some broad-winged like bats, flapping slowly, and sailing in easy curves; others like small, flying violets, shaking about loosely in short, crooked flights close to the flowers, feasting luxuriously night and day. Great numbers of deer also delight to dwell in the brushy portions of the bee-pastures. Bears, too, roam the sweet wilderness, their blunt, shaggy forms harmonizing well with the trees and tangled bushes, and with the bees, also, notwithstanding the disparity in size. They are fond of all good things, and enjoy them to the utmost, with but little troublesome discrimination—flowers and leaves as well as berries, and the bees themselves as well as their honey. Though the California bears have as yet had but little experience with honey-bees, they often succeed in reaching their bountiful stores, and it seems doubtful whether bees themselves enjoy honey with so great a relish. By means of their powerful teeth and claws they can gnaw and tear open almost any hive conveniently accessible. 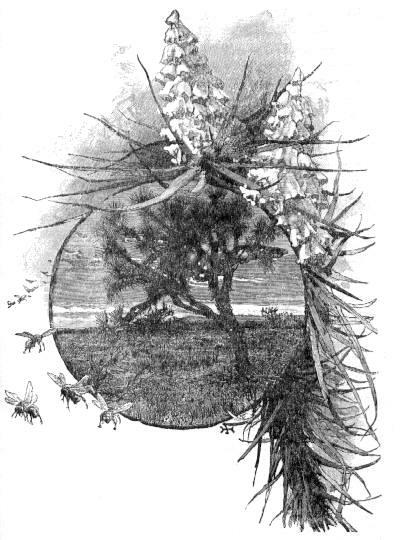 Most honey-bees, however, in search of a home are wise enough to make choice of a hollow in a living tree, a considerable distance above the ground, when such places are to be had; then they are pretty secure, for though the smaller black and brown bears climb well, they are unable to break into strong hives while compelled to exert themselves to keep from falling, and at the same time to endure the stings of the fighting bees without having their paws free to rub them off. But woe to the black bumblebees discovered in their mossy nests in the ground! With a few strokes of their huge paws the bears uncover the entire establishment, and, before time is given for a general buzz, bees old and young, larvæ, honey, stings, nest, and all are taken in one ravishing mouthful. Not the least influential of the agents concerned in the superior sweetness of the Shasta flora are its storms—storms I mean that are strictly local, bred and born on the mountain. The magical rapidity with which they are grown on the mountain-top, and bestow their charity in rain and snow, never fails to astonish the inexperienced lowlander. Often in calm, glowing days, while the bees are still on the wing, a storm-cloud may be seen far above in the pure ether, swelling its pearl bosses, and growing silently, like a plant. Presently a clear, ringing discharge of thunder is heard, followed by a rush of wind that comes sounding over the bending woods like the roar of the ocean, mingling raindrops, snow-flowers, honey-flowers, and bees in wild storm harmony. IN THE SAN GABRIEL VALLEY.—WHITE SAGE. 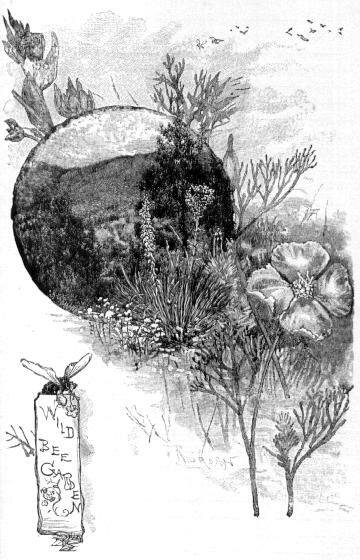 In Southern California, where bee-culture has had so much skilful attention of late years, the pasturage is not more abundant, or more advantageously varied as to the number of its honey-plants and their distribution over mountain and plain, than that of many other portions of the State where the industrial currents flow in other channels. The famous White Sage ( Audibertia ), belonging to the mint family, flourishes here in all its glory, blooming in May, and yielding great quantities of clear, pale honey, which is greatly prized in every market it has yet reached. This species grows chiefly in the valleys and low hills. The Black Sage on the mountains is part of a dense, thorny chaparral, which is composed chiefly of adenostoma, ceanothus, manzanita, and cherry—not differing greatly from that of the southern portion of the Sierra, but more dense and continuous, and taller, and remaining longer in bloom. Stream-side gardens, so charming a feature of both the Sierra and Coast Mountains, are less numerous in Southern California, but they are exceedingly rich in honey-flowers, wherever found,—melilotus, columbine, collinsia, verbena, zauschneria, wild rose, honeysuckle, philadelphus, and lilies rising from the warm, moist dells in a very storm of exuberance. Wild buckwheat of many species is developed in abundance over the dry, sandy valleys and lower slopes of the mountains, toward the end of summer, and is, at this time, the main dependence of the bees, reinforced here and there by orange groves, alfalfa fields, and small home gardens. 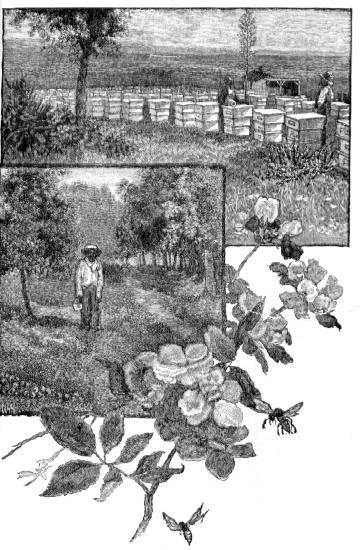 According to Mr. J. T. Gordon, President of the Los Angeles County Bee-keepers’ Association, the first bees introduced into the county were a single hive, which cost $150 in San Francisco, and arrived in September, 1854 [Fifteen hives of Italian bees were introduced into Los Angeles County in 1855, and in 1876 they had increased to 500. The marked superiority claimed for them over the common species is now attracting considerable attention.]. In April, of the following year, this hive sent out two swarms, which were sold for $100 each. From this small beginning the bees gradually multiplied to about 3000 swarms in the year 1873. In 1876 it was estimated that there were between 15,000 and 20,000 hives in the county, producing an annual yield of about 100 pounds to the hive—in some exceptional cases, a much greater yield. WILD BUCKWHEAT.—A BEE-RANCH IN THE WILDERNESS. 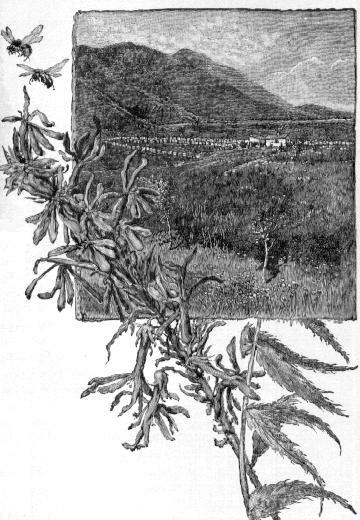 Even the colonies nearest to the mountains suffered this year, for the smaller vegetation on the foot-hills was affected by the drought almost as severely as that of the valleys and plains, and even the hardy, deep-rooted chaparral, the surest dependence of the bees, bloomed sparingly, while much of it was beyond reach. Every swarm could have been saved, however, by promptly supplying them with food when their own stores began to fail, and before they became enfeebled and discouraged; or by cutting roads back into the mountains, and taking them into the heart of the flowery chaparral. The Santa Lucia, San Rafael, San Gabriel, San Jacinto, and San Bernardino ranges are almost untouched as yet save by the wild bees. 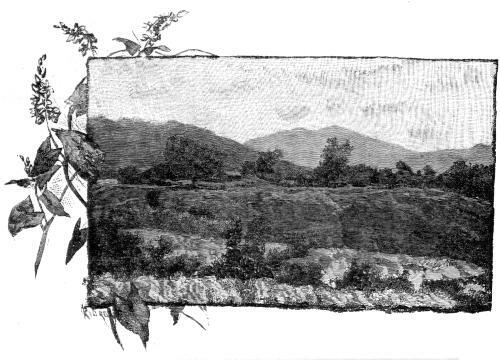 Some idea of their resources, and of the advantages and disadvantages they offer to bee-keepers, may be formed from an excursion that I made into the San Gabriel Range about the beginning of August of “the dry year.” This range, containing most of the characteristic features of the other ranges just mentioned, overlooks the Los Angeles vineyards and orange groves from the north, and is more rigidly inaccessible in the ordinary meaning of the word than any other that I ever attempted to penetrate. The slopes are exceptionally steep and insecure to the foot, and they are covered with thorny bushes from five to ten feet high. With the exception of little spots not visible in general views, the entire surface is covered with them, massed in close hedge growth, sweeping gracefully down into every gorge and hollow, and swelling over every ridge and summit in shaggy, ungovernable exuberance, offering more honey to the acre for half the year than the most crowded clover-field. But when beheld from the open San Gabriel Valley, beaten with dry sunshine, all that was seen of the range seemed to wear a forbidding aspect. From base to summit all seemed gray, barren, silent, its glorious chaparral appearing like dry moss creeping over its dull, wrinkled ridges and hollows. that way, too, for the mountains above here are just full of honey in the summer-time, and one of my neighbors down here says that he will let me have a whole lot of hives, on shares, to start with. You see I’ve a good thing; I’m all right now.” All this prospective affluence in the sunken, boulder-choked flood-bed of a mountain-stream! Leaving the bees out of the count, most fortune-seekers would as soon think of settling on the summit of Mount Shasta. Next morning, wishing my hopeful entertainer good luck, I set out on my shaggy excursion. About half an hour’s walk above the cabin, I came to “The Fall,” famous throughout the valley settlements as the finest yet discovered in the San Gabriel Mountains. It is a charming little thing, with a low, sweet voice, singing like a bird, as it pours from a notch in a short ledge, some thirty-five or forty feet into a round mirror-pool. The face of the cliff back of it, and on both sides, is smoothly covered and embossed with mosses, against which the white water shines out in showy relief, like a silver instrument in a velvet case. Hither come the San Gabriel lads and lassies, to gather ferns and dabble away their hot holidays in the cool water, glad to escape from their common-place palm-gardens and orange-groves. The delicate maidenhair grows on fissured rocks within reach of the spray, while broad-leaved maples and sycamores cast soft, mellow shade over a rich profusion of bee-flowers, growing among boulders in front of the pool—the fall, the flowers, the bees, the ferny rocks, and leafy shade forming a charming little poem of wildness, the last of a series extending down the flowery slopes of Mount San Antonio through the rugged, foam-beaten bosses of the main Eaton Cañon. For 100 feet or so above the fall the ascent was made possible only by tough cushions of club-moss that clung to the rock. Above this the ridge weathers away to a thin knife-blade for a few hundred yards, and thence to the summit of the range it carries a bristly mane of chaparral. Here and there small openings occur on rocky places, commanding fine views across the cultivated valley to the ocean. These I found by the tracks were favorite outlooks and resting-places for the wild animals—bears, wolves, foxes, wildcats, etc.—which abound here, and would have to be taken into account in the establishment of bee-ranches. In the deepest thickets I found wood-rat villages—groups of huts four to six feet high, built of sticks and leaves in rough, tapering piles, like musk-rat cabins. I noticed a good many bees, too, most of them wild. The tame honey-bees seemed languid and wing-weary, as if they had come all the way up from the flowerless valley. 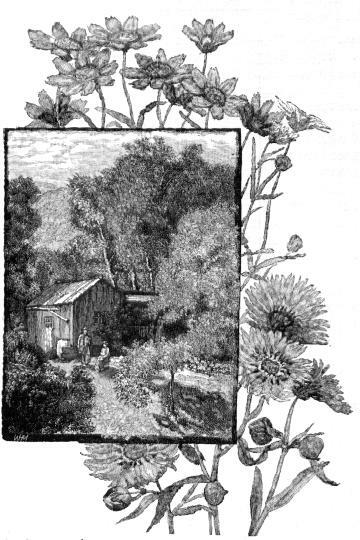 A BEE-KEEPER’S CABIN.—BURRIELIA (ABOVE).—MADIA (BELOW). Next day, in the channel of a tributary that heads on Mount San Antonio, I passed about fifteen or twenty gardens like the one in which I slept—lilies in every one of them, in the full pomp of bloom. My third camp was made near the middle of the general basin, at the head of a long system of cascades from ten to 200 feet high, one following the other in close succession down a rocky, inaccessible cañon, making a total descent of nearly 1700 feet. Above the cascades the main stream passes through a series of open, sunny levels, the largest of which are about an acre in size, where the wild bees and their companions were feasting on a showy growth of zauschneria, painted cups, and monardella; and gray squirrels were busy harvesting the burs of the Douglas Spruce, the only conifer I met in the basin. Behind the San Bernardino Range lies the wild “sage-brush country,” bounded on the east by the Colorado River, and extending in a general northerly direction to Nevada and along the eastern base of the Sierra beyond Mono Lake. The greater portion of this immense region, including Owen’s Valley, Death Valley, and the Sink of the Mohave, the area of which is nearly one fifth that of the entire State, is usually regarded as a desert, not because of any lack in the soil, but for want of rain, and rivers available for irrigation. Very little of it, however, is desert in the eyes of a bee.